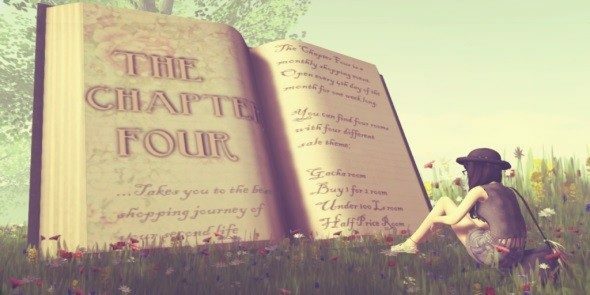 The Berenice Boots is Petit Chat release for the Chapter Four event which is open from now till 20th March 2017. The is not just a pair of boots because this is sold as a boot with customizable HUD, so you are getting lots of combinations and design with just one purchase. So you can tell that the number of combination is ... too many to count. Let's take a look at the HUD. 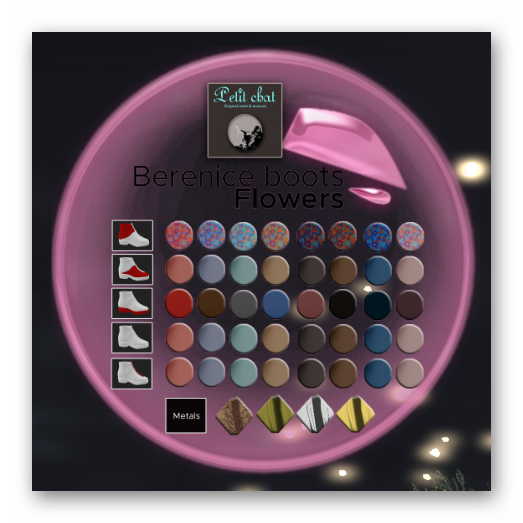 The HUD allows you to customize 5 separate components of the boots and each component consist of 8 different colors or texture. There is also customization for the metals part of the boots too with additional 4 designs. That is certainly a lot a lot of way you can make this boots to your liking and this is just one of the 10 HUDs available! I think this is obvious that this is from the Flowers series and Kitty simply loves the way this pinkish looks feel like. There is also a Roses seres where you get all the thorny beauty all by itself. This is one of those time when Blue can looks so cute on the Animal Berenice Boots. From the color, you can tell this is not from some fantastic beast, but synthetic. Still, it looks good and feel good. This is what a Dragonscale Boots +2 looks like. At least in the modern day context. Still, would anyone challenge you if you wear this to a medieval sim? Kitty wonders.